Do you know how hard it is to get some males to use skincare products? They tend to think that their skin will take care of itself and they shouldn't mess with nature. Other than the perfunctory shaving creams and hair styling products, skincare is not a word the men in my household understand. In fact, it's so foreign to them it's almost akin to asking them to wear lipstick or paint their nails. But men's skin like any other skin type, have different and specific needs. Men’s skin is generally thicker than women’s skin. They have larger pores that are more prone to clogging as they are a lot more oiler than women (15% more so in some instances) and as they are often shaving their face so are frequently disrupting the skin natural barrier in these facial area, they need skin care solutions that take all these factors into account. So when I received some very masculine skincare products recently, I passed this over to male members of the family with the stern order that they are to use it every day - all for the purpose of research of course. Putting that scientific spin to it seemed to do the job and they were more diligent with trialling the products than I've seen ever seen them use any lotion or creams. I've previously mentioned this newish Aussie brand back in November and the guys were kind enough to organise a few products to be sent for trail. 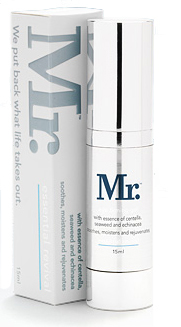 Made from all indigenous Australian products, the entire Mr range is designed to help men tackle today’s lifestyle. After 3 weeks of use, here are the verdicts from the boys. 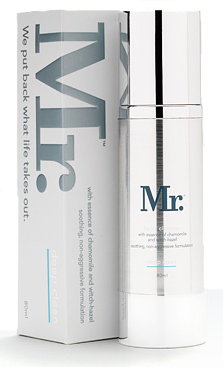 Impressive packaging - this comes in a sleek silver pump style bottle with a cap top that you see with many high end products. It definitely impresses and I suspect the packaging alone will quickly win over any unconvinced user to try the product. Clear gel with a light scent (I took a sniff and to me it seems to have a light rose scent). It was not offensive to the boys' nostrils at all. In fact, I suspect they like the scent very much as I caught my dad sniffing at it the other day when he was about to use it. Is light and non-greasy which that is a big plus with males. It was slightly tacky immediately after use that the boys didn't quite like but it disappeared within 5 minutes. Although light, it isn't too fluidy and finger patting it into skin is recommended to get the product to absorb into the under-eye area - a method that took some demonstration to the boys before they learnt this new way of applying the product (their usual modus operandi is to slap it on and rub it in like crazy - a big no-no in delicate eye areas). Contains seaweed, centella, and Echinacea to soothe and restore moisture to skin and works well in de-puffing eyes in mornings and gave the eye area an immediate awaken look. There was a slight brightening associated with this gel but no real difference was seen for prominent eye bags or deep wrinkles after 3 weeks use but I'm not sure if there would be visible difference on mature and neglected skin such as my dad's who's almost 60. On younger skin, I expect results to be more noticable/effective. Contains micro-fine crushed limestone and sandstone from Central Australia to exfoliate without scratching or harming skin during daily use. Easily removes, dirt, oil, dust and skin cell build ups and has a soothing base made with rose and tea tree oil to soothe and repair skin from any scraps or razor nicks. Left face cleansed, refresh and softened without being too drying. No-fuss and easy to use, this got the boys tick of approval within the first day of use. Comes in the signature sliver pump style bottle that is sleek and functional, this is well packaged and looks good in the bathroom stand or in the sport bag at the gym (yes boys, you should wash your face after a big sweaty workout). Gel based cleanser that is soothing and gentle whilst at the same time powerful enough to provide a deep clean to remove the daily grime that accumulates on skin after a long day out at work. 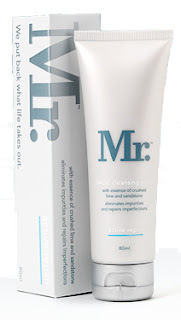 This non lathering product with aloe extract has great skin softening powers and is soothing to use after shaving - it was an instant hit with the brother. Also contains chamomile essence and witch hazel extract - all of which are known for their soothing and calming properties which is why this is great for sensitised skin, especially after suffering from razor burns. Next time you are stuck for ideas on how you can get your man to start taking good care of their skin, try looking for products that are simple and fuss-free to use and not only will make them feel better in their skin but isn't too fancy by appealing to their masculine sense of style with metallic designs and muted neutral packaging. Mr.'s collection is certainly one to look out for to tempt him into developing his own skincare regime or prevent him from borrowing/stealing your favourite skincare products. The Mr. Range is available online or exclusively at shaver shops and selected salons. Note online prices are quoted ex-GST, which is added in when processing the sales order. The above products were sent for consideration.